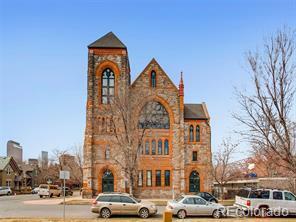 Don’t miss this stunning 1889 church loft. Nestled in the Uptown/San Rafael neighborhoods, this unit features exposed stone walls and original two-story stained glass windows. The open main level has a gourmet eat-in kitchen with oversized pantry, high-end stainless steel appliances, wet bar with wine cooler, and entry area powder bathroom. The living room/dining area faces a wall featuring a custom reclaimed wood and iron shelving unit. The gorgeous, light-filled upper level contains a spacious master bedroom with well-appointed en-suite, guest bedroom, hallway bathroom, and two open landing nooks perfect for home office use. The vast rooftop community deck is perfect for large parties or quaint gatherings. This unit also comes with a reserved gated parking space and additional basement storage. With choice restaurants, bars, and shopping just a short walk away, this home is waiting for the urban dweller looking for history, culture, and beauty in one place.